Most people I know who are as fanatic about music as I am turn to it at times of sorrow, joy, frustration and, more often than not, to take one out of the often-mechanical routine of daily life. The following 2 CDs do just that and, delightfully so, in different manners. 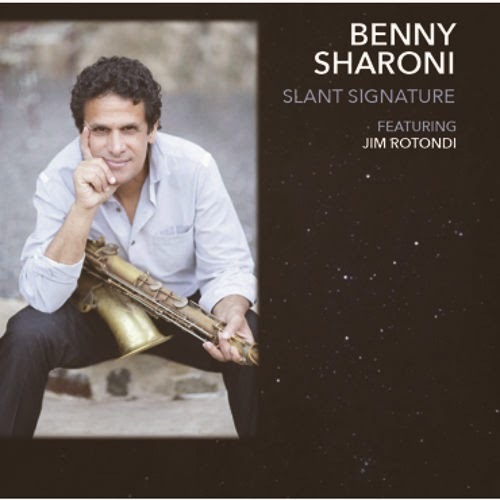 Israeli-born and raised tenor saxophonist Benny Sharoni moved to the United States nearly 3 decades ago. The music he creates is steeped in the traditions of the 1950s and 60s, especially the sounds created by Art Blakey's Jazz Messengers. Yet, he is no slave to that sound as attested by the 8 tracks on his new CD, "Slant Signature" (Papaya Records). What one notices on initial listening is the sense of joy that exudes from this music. The swing starts in the rhythm section of Todd Baker (bass) and Steve Langone (drums), is bolstered by the strong piano work of Joe Barbato and abetted by the hardy guitar playing of Mike Mele. 4 of the cuts feature the bright and bluesy tones of trumpeter Jim Rotondi. The album bursts out of the gate with the sextet firing on all cylinders on the Sharoni original "Minor City." The rapid-fire melody section and solos rise and fall on the strength of Baker and Langone; solos are short but each player makes the most of their opportunity. Rotondi and Sharoni show their love of blues on Freddie Hubbard's "Down Under" and Ray Bryant's "Tonk", the latter with a most sprightly beat pushed by the excellent piano support and dancing brushes work. Surprisingly, the trumpeter does not appear on Lee Morgan's sweet ballad "Ceora" - the leader's smooth tones reflect the sound of Stan Getz, he doesn't rush his solo, opting to caress the melody and create a solo that flows easily over the gentle rhythms. Other highlights include the title track which takes its name from a particular hard rubber mouthpiece created for saxophonists by Otto Link. The song itself celebrates the fluidity of Sharoni's playing and also features a smoking solo from guitarist Mele. The funky "Bitter Drops" has a groove out of New Orleans (hard to miss in the snappy drumming of Langone and the dancing piano work of Barbato) and one has to dig the slippery melody line played by guitar and sax. Hard to miss the exuberance in the music of Benny Sharoni as it jumps out of the speakers into your brain (and feet as well). His passion for jazz (and, if you have ever met him, for life) is poured into the sounds he creates and leaves no place for anger or frustration - even the blues he plays will make you smile. This is not music about technique or modern fashions but "Slant Signature" has a boatload of soul. Give it a whirl. For more information about Mr. Sharoni and his music, go to www.bennysharoni.com. Alto saxophonist Angela Davis moved to the United States from her native Australia in 2008 and has steadily been building a career as a musician and educator. Her 2013 debut recording, the aptly-titled "The Art of The Melody", displayed a honey-like tone, a softer style akin to Lee Konitz and found her happily ensconced in a quartet setting. Ms. Davis's second CD, "Lady Luck" Nicholas Records) actually features 2 quartets. There's Dan Tepfer (piano), Richie Barshay (drums) and bassist Linda Oh (who also played on the first disk) plus a string quartet composed of violinists Sara Caswell and Joyce Hammann, violist Lois Martin and cellist Noah Hoffield playing arrangements by fellow Australian transplant Steve Newcomb (the album is produced by the fine Australian trumpeter Mat Jodrell). To record this album, Ms. Davis won the Empire Theatres Foundation Brian Boak Outstanding Performer Bursary, an award given to performers and artists from south-east Queensland, Australia. "Lady Luck", which takes its name from a Thad Jones composition, is an album of ballads. Opening with the gentle swing of Jules Styne's "Make Someone Happy", it's plain to hear this is not an ordinary jazz-with-strings date. First and foremost, the rhythm section is extremely active (without being intrusive) behind the soloist and second, the strings are there for more than color, actually supplying counterpoint on the melody section. The dark colors created by the strings set the tone of the lovely version of Michel Legrand's "You Must Believe In Spring", providing a cushion for the sweet, clear, tones of the alto saxophone. Brashay's subtle brush work, Ms. Oh's foundational bass lines, and Tepfer's glorious piano solo, all fuse to make this track a highlight of the recording. 3 of the 8 tracks are original works. There's an intensity to the bop rhythms of "A Thousand Feet From Bergen Street" (getting its name from an incident in which the composer was stuck underground in a New York City subway train) - the strings are truly incidental as this cut allows Tepfer, Ms.Oh, Barshay and Ms. Davis to stretch out. Swing they do, moving through the jaunty melody with great ease and joy (must come from the relief of the train finally moving). "Nola's Waltz", dedicated to the saxophonist's grandmother, also swings but gently this time. Newcomb's string arrangement does a splendid job of introducing and then ushering out the bass solo, also moving in and out of Ms. Davis's sweet solo. There is a tenderness as well to "Hymn To The Lonely", quite noticeable in Tepfer's fine solo plus a wistful quality to the alto solo. The program closes with 2 pieces that have a deep spiritual feel. Producer Jodrell's "Till We Meet Again" skillfully blends its handsome melody with a string arrangement that lingers throughout the piece, like clouds moving across a late afternoon sky. Go back and listen to how Barshay and Ms.Oh move the music, how the alto solo has such a positive, joyous, feel and how Tepfer's sparkling solo builds off those feelings. The final track, "Abide With Me", is a hymn by William Henry Monk from the 19th Century. The duo of Ms. Davis and Tepfer play through the melody and then create variations as the song moves forward (the gentle quality of the alto phrases is a fine counterpoint to the flowing lines of the piano) and the closing minute is simply lovely. As I intimated at the top of the post, music can and often does takes out of the mundane. That music need not be complicated nor thunderous to achieve the goal the listener desires (although, for some people, the sheer volume of a hard rock song can be a day-changer). "Lady Luck" illustrates how saxophonist/composer Angela Davis can, with the help of gifted collaborators, create a musical environment that exudes great emotion and, especially, joy. For more information, go to www.angeladavismsic.com.